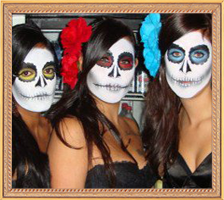 Face the Art Entertainment - Face Painting | Photobooth | Clowns | Bubbleology | Henna | Entertainers | Balloonists | Theme Parties | Party Rentals | Candy Art | Inflatables | More! BE TRANSFORMED INTO A WORK OF ART! Highest quality face paints, brushes, glitter, sponges and stencils that we have built up over time; most kits we carry are worth over $4000! We always carry a well-presented, tidy kit with everything sterilized and clean. Always professionals. We have years of training, perfecting our techniques and speed and design knowledge, always updating our designs. Thorough and comprehensive hygiene procedures (clean brush for every face, alcohol and soap rinsed brushes, fresh and clean sponges, new Q-tips every time we paint lips, clean water dispensers, no dirty standing water. EWWWWW! Every child is always treated special and is given their special moment with the face painter. A member of the Canadian Association of Face and Body Artists, Clowns Canada and carries full public liability insurance with over 40 years combined face painting experience and expertise. Most travel expenses are covered in the GTA & SW Ontario. You always get a face painter that loves their job, is professional, loves kids, is always happy, kind hearted, fun loving, and has a friendly attitude that will impress your guests. 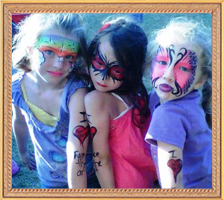 Leave your guests wondering where you found that amazing face painter and asking how they can get contact info! You will never be let down and will be extremely pleased that you hired a long time respected professional. Do not settle for anything less that the best and trust only Face the Art’s face painters. Click here for the picture gallery!